Sporty soccer player Cassie is ready to play! When an email from Go! Go! Sports Girls Dolls landed in my inbox, I got genuinely excited. Unlike some dolls that don’t exactly set the best example for little girls, the Go! Go! Sports Girls are designed to promote self-appreciation and the benefits of daily exercise, healthy eating and sleeping habits, self-esteem, and overall positive life skills for girls. As a mom to a little girl, I’m always trying to make sure I’m setting a good example when it comes to eating right, being active and appreciating the body I have, so the Go! Go! philosophy of “appreciate and be true to yourself” is definitely something I can get behind. Designed for ages 3 to 12, each of the plush Go! Go! Sports Girls is dressed and ready for her sport, with accessories included. Soccer player Cassie has her soccer ball (left), and golfer Brooke has her club and golf ball. Suzi swimmer wears her sporty swimsuit and goggles. 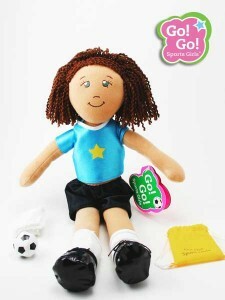 No matter what sport a girl is interested in, one of the sports dolls is bound to appeal to her, with a total of 11 dolls available. Even activities like dance and gymnastics are represented! Love it. These dolls would be great for Christmas and birthdays for any little girl in your life. And at really affordable prices online (I’ve seen them as low as $12.95! ), this item won’t break the bank. Check out the video for more on the girl-power message of these dolls. Can’t see the video? Click here to see more on the Go! Go! Sports Girls Dolls!